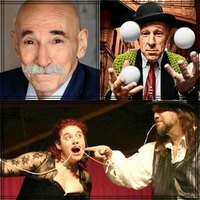 This show is themed to be a Magic & Variety Show and will try to bring back a Vaudeville feel with some incredible and unique acts. First up will be veteran comedian and magician Rich Marotta, followed by a magical interlude by Harvey Leeds, with a guest appearance by world-class juggler Will Shaw. Closing the show will be EvilDan and Colleen The Sideshow Queen who will simultaneously amaze you while making you laugh and cringe. Hosting the show will be Meir Yedid. Looks like a really fun...and professional...production! If I still lived in the area I would definitely be there! We've got a special "holiday trick" planned for this show since it's close to Christmas. I'm sure it'll be the topic of conversation at many dinner tables this Christmas. Meir Yedid said that more than half the house is sold out. Seats about 75 - 40+ sold - usually have about 20-25 walk ins. If you're in the area I hope you can make it to the show. That’s fantastic, Dan! If I was in the area I would be there to enjoy the show! It was a great show. Cool venue. Cool owner of venue. Awesome crowd. Outstanding! Glad to hear it went well. Thanks for letting us know.